King Kong is currently rampaging through cinemas in Kong: Skull Island. To celebrate the return of our favourite giant ape (sorry, King Louie…), we’ve compiled some Kong trivia to impress your pals with after you’ve watched the movie. Everyone’s favourite giant ape was created by Merian C. Cooper, a US Air Force officer turned screenwriter, director and film producer. Numerous factors inspired Cooper’s creation. At a young age, he read about a gorilla of “extraordinary size” who natives called the “King of the African Forest” in a book called Explorations and Adventures in Equatorial Africa, although Cooper claimed the idea of a giant ape attacking New York came to him in a dream. The first Kong moment Cooper thought up was actually one of the last in the film; Kong’s last stand atop the Empire State Building. Cooper came up with it after seeing a plane flying over the similarly-sized New York Insurance Building. With the help of famous English writer Edgar Wallace, Cooper set to work on a script for a film about his new dream monkey and the rest, as they say, is history. How many King Kong movies are there? Officially, eight. Unofficially, a metric ton of spin-offs, rip-offs and parodies. The original film, and some would say the best, was made by Meriam C. Cooper and Ernest B. Schoedsack in 1933. It’s a classic tale of girl travels to a remote island with a film crew, girl meets big monkey, big monkey falls in love, big monkey attacks major landmarks and big monkey ends up dead in the street after being shot by loads of planes. Cooper and his team used stop-motion to create Kong, crafting four scale models out of rubber, aluminium and rabbit fur. Creating Kong’s movements took a painstaking amount of work, with his T-Rex fight taking seven weeks to produce! Still, it was worth the effort. King Kong received rave reviews, with the jaw-dropping special effects receiving particular praise, and is easily one of the most iconic movies ever made. Less iconic is Son of Kong, a comedy sequel released just over 9 months later. With Big Kong dead in New York, the film focuses on his fun-loving friendly son. Carl Denham, the bloke who captured Kong in the first film, travels to Skull Island to find some treasure but is soon attacked by the island’s various beasts. Enter Little Kong, who protects Denham and his crew. 29 years later, Kong reappeared in Japan to answer one of the most important questions ever posed: who would win in a fight between King Kong and Godzilla. King Kong vs Godzilla is easily one of the best monster movies ever made, even if it looks a little ropey these days. A second film, King Kong Escapes, came out a few years later but couldn’t match up to the majesty of Kong’s first Japanese adventure. In 1976, Dino De Laurentiis produced a remake of the original film starring Jeff Bridges, Charles Grodin and Jessica Lange. It’s lighter than the original but was a huge success at the box office, despite Kong ending the film atop the Twin Towers rather than the Empire State Building. A sequel, King Kong Lives, was released 10 years later and stars Linda Hamilton trying to find a heart transplant for Kong (yes, really), who was kept in a coma after the original. It bombed at the box office but has become something of a cult classic. After a 19 year break, Kong finally returned to the silver screen in Peter Jackson’s modern remake. 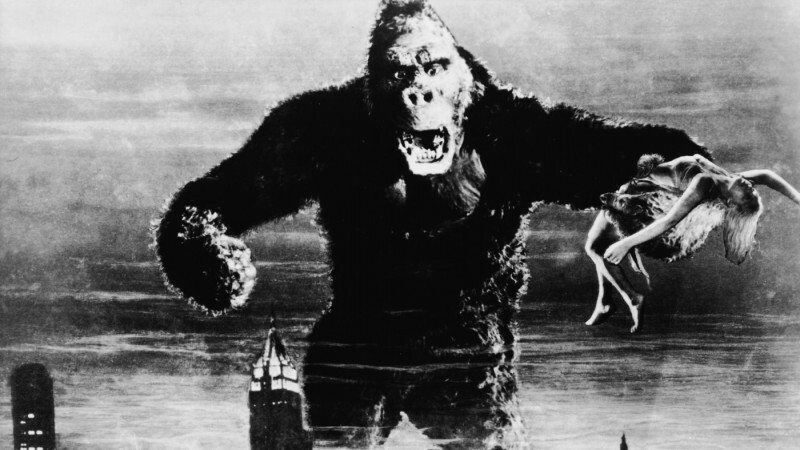 King Kong was a massive passion project for Jackson, who saw the original when he was nine and attempted to remake it using a Super 8 when he was 12. Kong himself was produced using motion capture, with Andy Serkis spending time with gorillas in order to master their movements. It was a massive success, generating over $500 million at the box office! Which King Kong movie is the best? According to Rotten Tomatoes, the original 1933 film with a whopping 98%! In second place is the 2005 remake with an impressive 84%, while Kong: Skull Island is in third with an almost-as-impressive 81%. How much did King Kong make at the box office? The short answer: enough money for a lifetime’s supply of bananas with change to spare. The long answer: the original made $10 million worldwide, the 1976 remake made $90.6 million, Lives made just $4.7 million and the 2005 remake made a frankly ridiculous $550 million. When you account for inflation, the total Kong has made at the movies is pushing $1 billion dollars. And finally… how tall is King Kong? Ah, the most important question of them all! Kong actually varies in size across the films. According to the official promo material for the 1933 film, Kong is 50 feet tall. However, the scale models made for the film put him at 18 feet tall in the Skull Island scenes and 24 feet tall in New York. In the Peter Jackson remake, Kong is based on a proper silverback gorilla and stands at a mere 25 feet tall. He’s also around 100 – 120 years old! In the latest incarnation, Skull Island, Kong has a massive growth spurt and now stands at 100 feet tall. Director Jordan Vogt-Roberts has said that Kong is only an adolescent at this point too, giving him time to grow before his planned movie showdown with Godzilla (who is around 350 feet tall) in 2020. If you need something new to watch, check out the monster-sized collection of DVDs on the musicMagpie Store right now – all from just £1.19 with FREE delivery! With mother! in cinemas soon, here’s an introduction to its director: Darren Aronofsky!